ABOVE The tree is decorated with tufts of cotton tucked in among sterling silver, baby rattles, cups, and napkin rings. 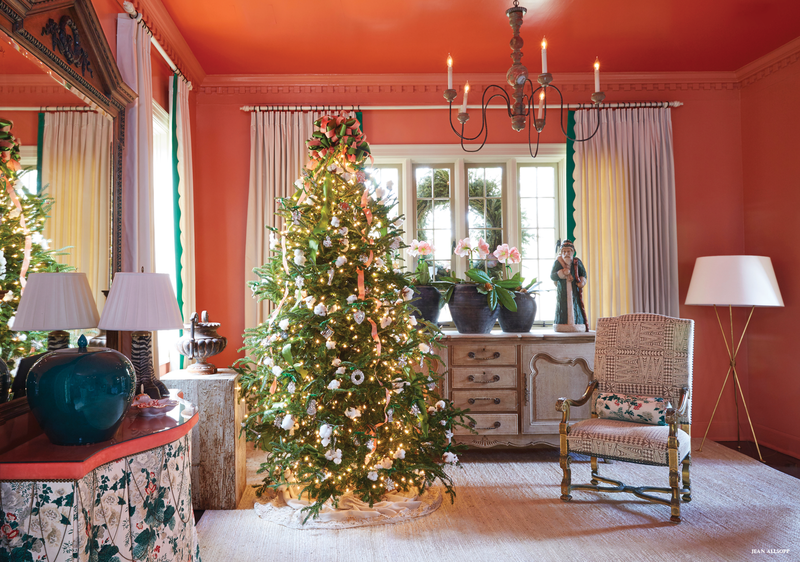 White lights and a large green-and-coral bow with trails of ribbon complete the charming look. ABOVE On the mantel, an iron piece topped with a crown holds cedar, white Tibet roses, snapdragons, and magnolia. The 1920s house was ideally located, but Ragan knew some changes were in order for the inside. 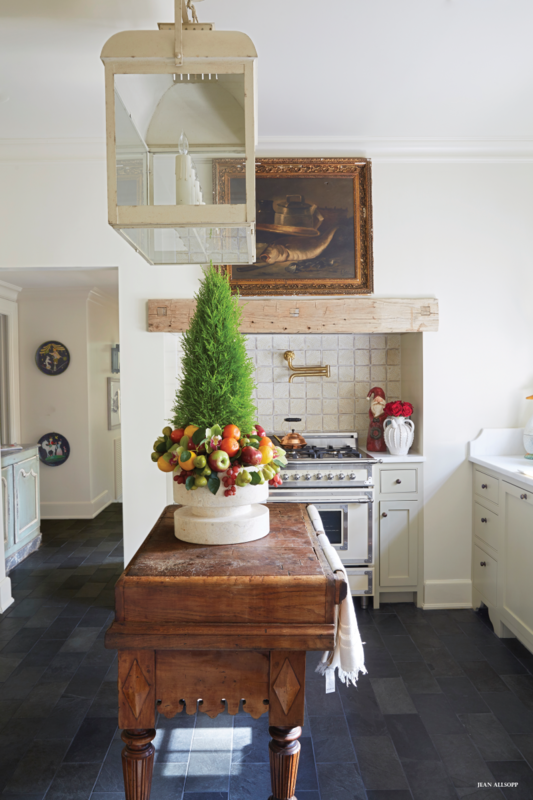 “We reconfigured the rooms, painted, and totally updated the kitchen, ” she says. While Ragan’s day job involves serious number crunching as the vice president and treasurer of Tacala Companies, she also has a passion for style. With a treasure trove of collected pieces to place in the house, she just needed a little help putting it all altogether. Melanie Pounds of Patina in Mountain Brook came into the picture. “I had long admired Melanie’s work and knew she was the person to make my vision come to life, ” says Ragan. The only catch to the partnership involved Ragan’s fondness for color. “I challenged Melanie a bit to get out of her comfort zone of more understated, neutral interiors, and she was up for it, ” explains Ragan. 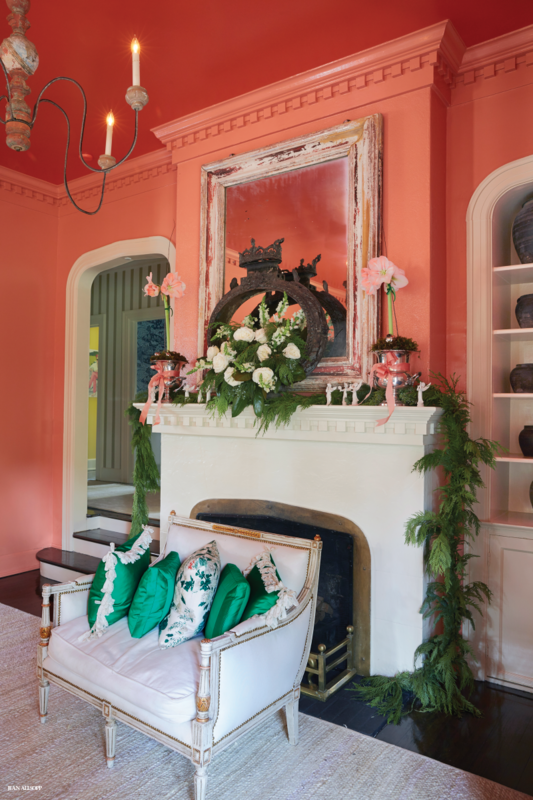 The beautiful result is a coral-colored lacquered living room with a deeper coral on the ceiling that creates a cozy elegant attitude. 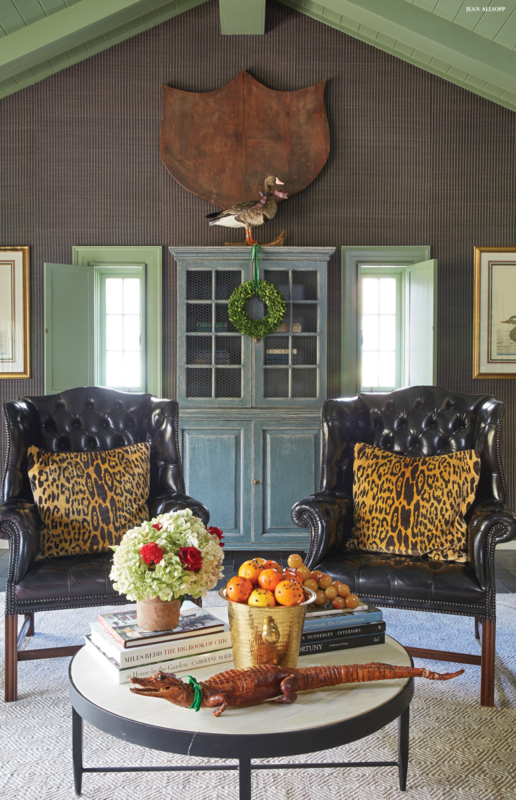 Yellow envelops both guest rooms, while deep green covers the walls in the den and mudroom. 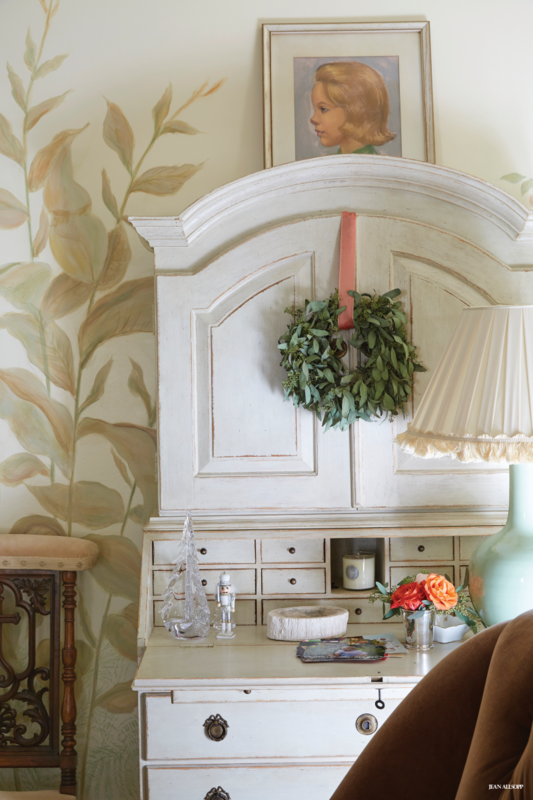 The home shows off finds that Ragan unearthed in antique shops, flea markets, and estate sales, as well as from online sources. One piece from Ragan’s collection was destined for a starring role. “I have a pair of swan containers, and I am absolutely obsessed with them, ” says Ragan. 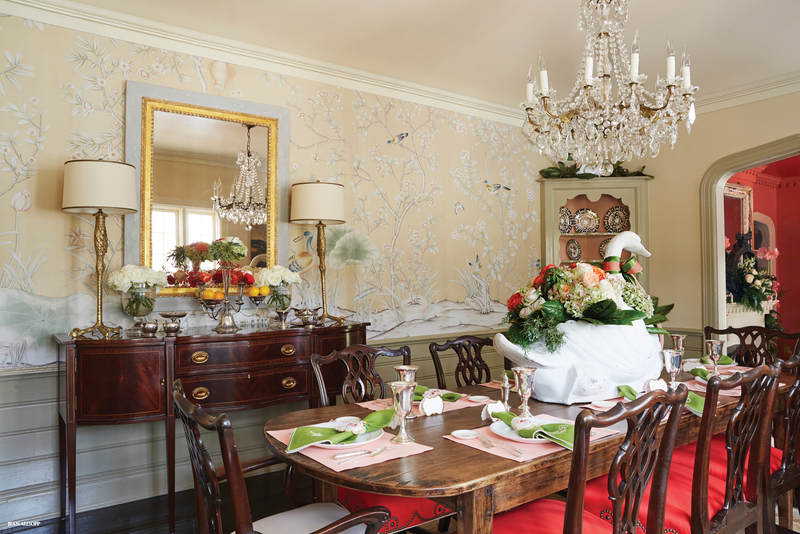 One of the swans, placed on the dining table, shows off a cornucopia of flowers and greenery. 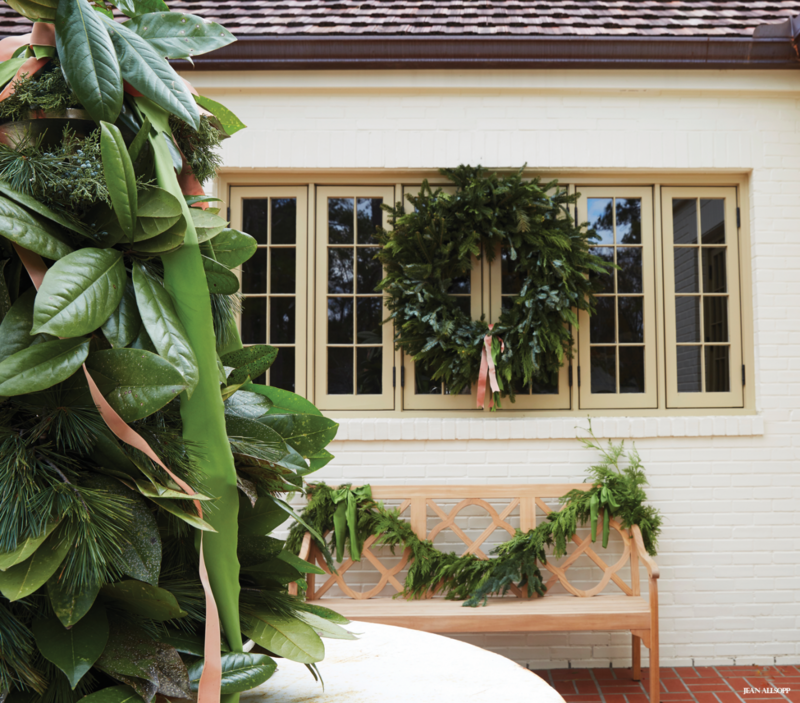 At every turn, there are holiday treasures, flowers, and greenery to attract the eye. “Ragan wanted this tour to be a really special experience for the visitors, ” says Mary Cox. “Some people came back two or three times during the day to take everything in.” And for the Cains, seeing the success of the tour was the perfect way to celebrate their homecoming. 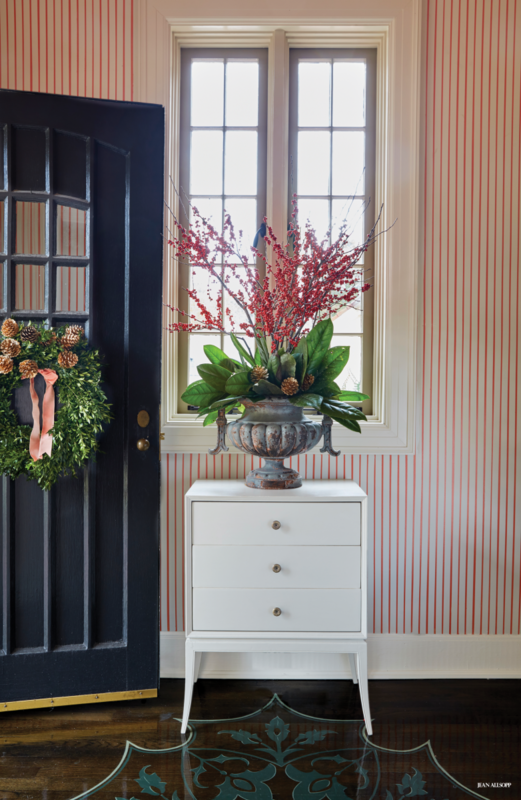 ABOVE LEFT An urn filled with ilex, magnolia, and gold-painted pinecones greets guests in the entry. Jan Roberts of Finishing Touches hand-painted the detail on the floor. 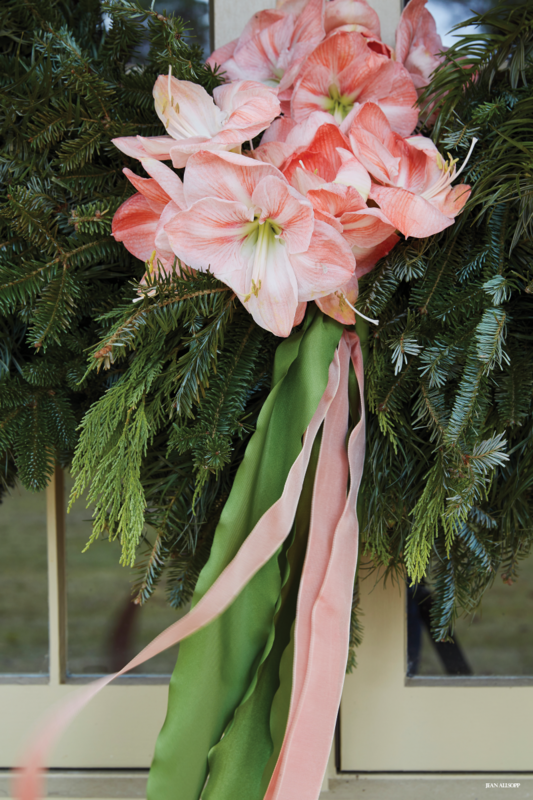 ABOVE RIGHT Amaryllis blooms perfectly fit the home’s color palette. ABOVE A favorite vessel, one of a pair of swans is filled with antique hydrangea, Juliet garden roses, white O’Hara roses, magnolia, and cedar. 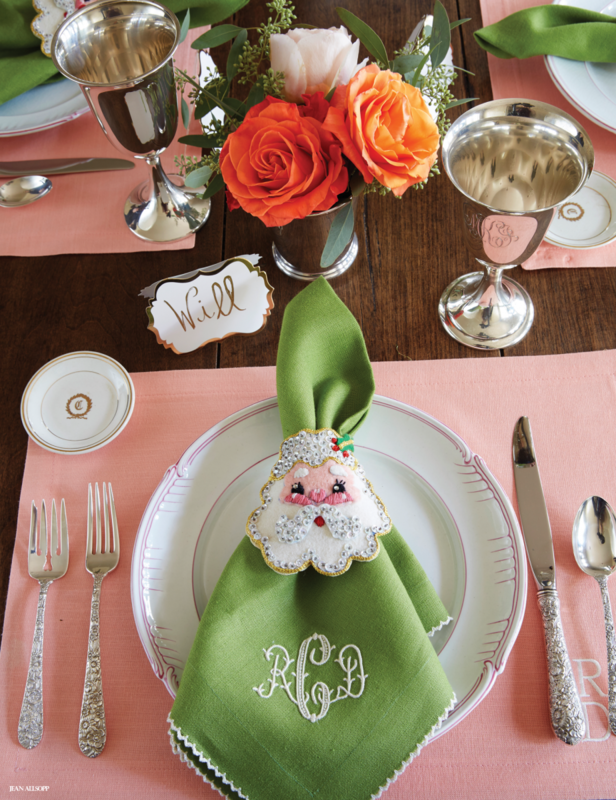 ABOVE LEFT Vintage napkin rings bring a cheerful note to the place settings. ABOVE RIGHT Elegant hand-painted botanicals on the wall provide more visual appeal. 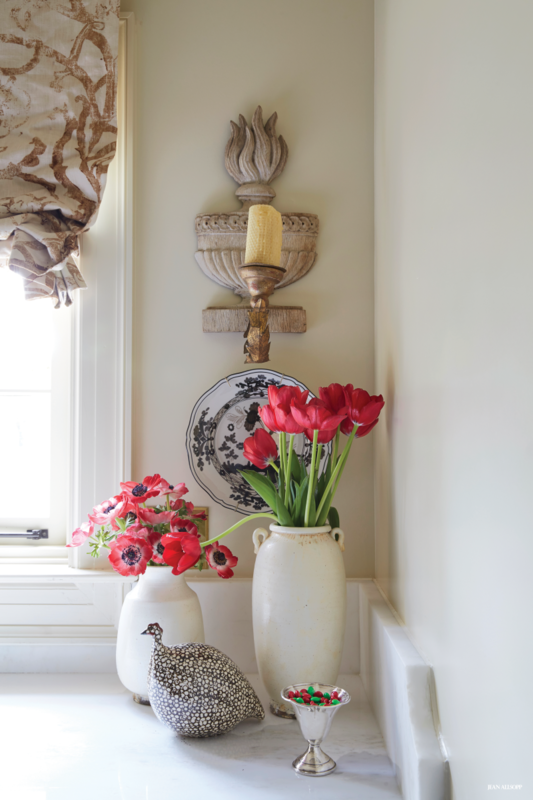 ABOVE RIGHT Bright red tulips and anemones liven up a kitchen corner. ABOVE The color palette takes a bit of a turn in the master bedroom with more muted tones. 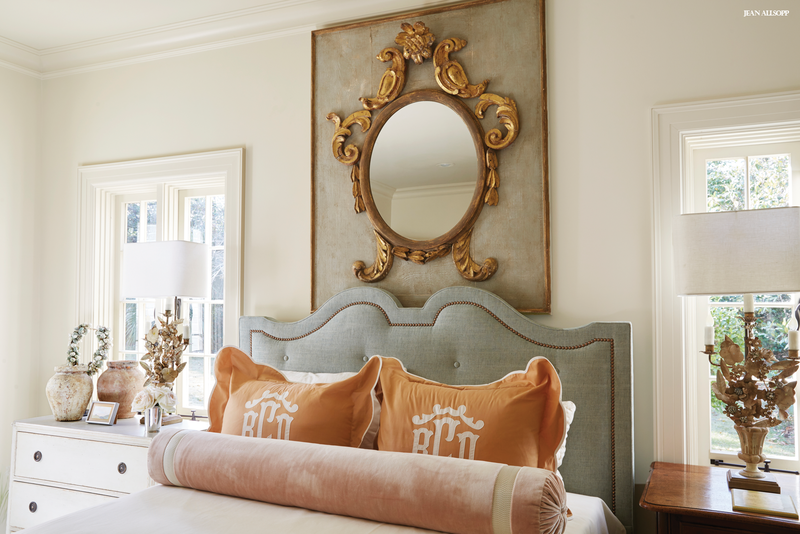 A gilded French mirror, Italian tole lamps, and a velvet bolster pillow add layers of luxe to the room. ABOVE LEFT “I had a fit when I saw this Carolyn Goldsmith painting and had to have it, ” says Ragan. “It brings so much interest and color to this small space.” A banquette and round table make the most of this tight nook. 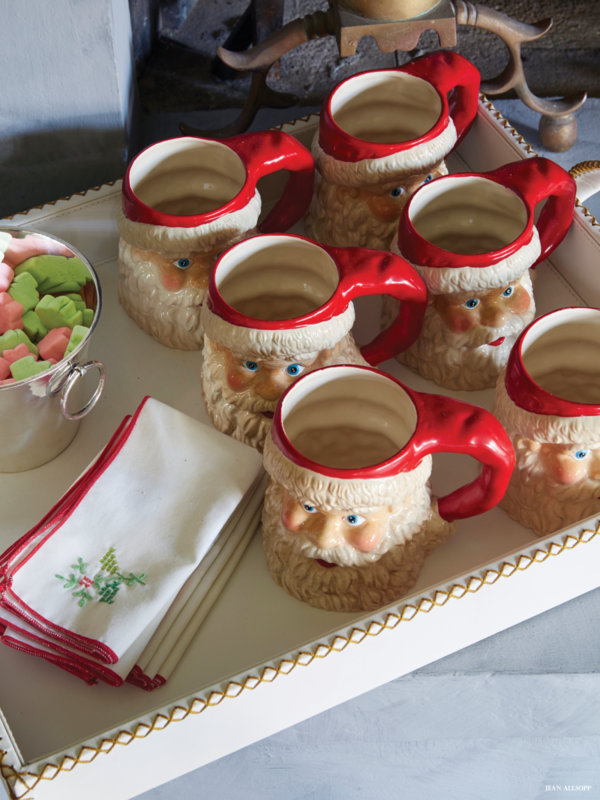 ABOVE RIGHT Santa mugs add a touch of whimsy to the décor. ABOVE LEFT The den’s handsome walls are papered in grass cloth set off by green trim in an artichoke color.